A little under two years prior to this missive I bought my first DSLR. At the time there was only one real game in town under $1k; the Digital Rebel. Two years is a long time in technology and as cameras have become more advanced, buying a new camera has become more like buying a new laptop than buying a new guitar with a similar life span and similar progress between new models. My old 300D was still going strong and when the 350D came out I was not tempted at all to upgrade just for the sake of 2 megapixels and a little more speed. However, when the 400D was announced at 10 megapixels and with dust reduction technology, I knew the time was probably right to upgrade. To be honest, it wasn't more megapixels, dust reduction, the much larger LCD, or the newer sexier body that tempted me but speed and memory. The 300D took 3 seconds to start up and I was frustrated with missing shots while waiting for my camera to boot. I shoot RAW 95% of the time and I was also tired of filling the memory buffer and having to wait long seconds for the 300D to write to the flash card before I could continue shooting. So, father Christmas brought me my new camera, however, I know she paid $800 for it with a kit lens from Ritz. Why get the kit lens as I already owned it from my first Rebel and it is not a great lens? In it's defense it does go pretty wide and I am not intending to get rid of the old Rebel. Recently my wife (father Christmas) has been getting into photography herself and, despite protests that she didn't feel ready for a DSLR I knew there would be times in the very near future when we both were out and shooting DSLRs. I already had two standard-ish lens (28-105+) so having two kit lenses would mean we could both shoot wider at the same time too. So what was it like moving from the 300D to the 400D? In a word, undramatic. It's like getting into a second generation Miata after driving the first generation one for a few years; the body is a bit sleeker, it's a bit faster, the pop-up head lights have gone but it still feels and handles the same. I wasn't anticipating magnitudes of improvement as I didn't want to set myself up for disappointment. First the speed, the reason I wanted the upgrade. Here I was not disappointed at all. The 400D starts up much more quickly than the 300D (less than 1 second compared to 3) even though the 400D goes through a sensor cleaning cycle every time you power up by default. Reading through the techno-babble, this cleaning cycle involves shaking the sensor to loosen the dust - it seems to work for ultra-sonic toothbrushes so why not image sensors? Dust on the 300D has not been a massive problem for me even though I change lenses pretty frequently, but recently I had been aware of quite a few specs which were apparent on plain areas of my image, e.g. blue sky, when I shot stopped down. Cleaning the sensor is not such a chore, neither is digital spotting of affected images in PhotoShop but it would be nice to have the sensor less sensitive to dust problems in the first place. The little "sensor cleaning" animated graphic on the rear LCD as you power up is reassuring; time will tell if the feature is effective or not. That rear 2.5" LCD does provide a lot more real estate than the 1.8" of the original Rebel. It gives you a fighting chance of telling if the image you just took is well exposed and properly focused. Of course, there's no substitute for getting the image up on the big screen of your digital darkroom but the new screen is a significant improvement. With all that new screen real estate and the smaller body something had to give. In this case it was the monochrome status LCD that was above the review screen on both previous Rebels. 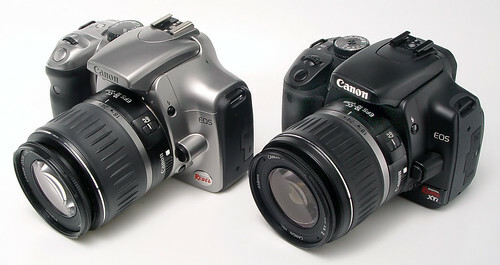 The large LCD on the 400D now serves duel purpose as both the status and the review screen. I'm still not sure if I miss the status LCD or not. Some users do bemoan it's loss and say that it makes the camera more amateurish but it seems like a reasonable compromise to me. I actually found the old status LCD difficult to read. Having the same data displayed on the larger review LCD has helped me check my settings faster this far and I can now see the ISO setting as well as shutter and aperture settings without having to press any additional buttons. The old problem for shooting for the first 10 minutes of a new shoot with the ISO set too high because you forgot to set it back to 100 after using the camera last night, is all but eliminated. Of course, much of the same data is available in the viewfinder as in all the Rebels, and that is where I use it the most. That new, large LCD being on most of the time probably uses more power. The 400D shares the same battery as the previous 350D but I was a little shocked to see how minuscule the battery is compared to the old 300D's battery. I did manage to occasionally exhaust the battery of my old 300D if I was shooting for long periods with stabilized lenses. These days I rarely shoot with anything else. I have gone on photo strolls with the new 400D that have taken a few hours and have resulted in 200 or so exposures and I have yet to see a battery warning indicator, however, this is no better or worse than the old 300D this far and I can't claim to have stress-tested the 400D yet. 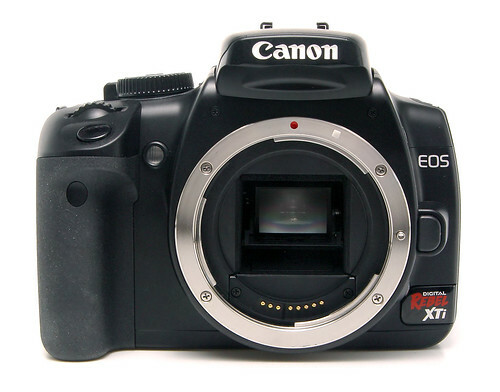 I will be getting a spare battery for this camera as I do for all my digital cameras. I may also consider the battery grip for more piece of mind on longer shoots. The battery then is another feature to chalk up in the "wait and see" category. Quite a few people buy the battery grip to 'improve' the 350D's and 400D's heft and handling as many interweb forum pundits claim that the new Rebel body is too small and light for their manly hands. Let me quickly address this machismo BS; what are you guys (of course it's men) talking about? Do you complain that your point and shoot digicam is too small to use effectively? Did you complain about the Olympus OM1 being too small after your Nikon F2? You probably did. You are getting hung-up on the sales pitch that professional gear is big, heavy and solid. This is true but the Rebel is not a professional camera; it doesn't pretend to be one. It is an enthusiast's camera and there are many advantages to being small, light and fully featured such as portability, stealth and user fatigue. If you're worried about pose value don't buy the Rebel but don't then try to justify the lower resolution 30D for more money based on the size of the camera body. Over all I like the new Rebel body. It's a little more angular and business-like than the first Rebel. I chose the plain black finish over my old painted silver one which adds to the work-horse effect. Although I do prefer the black finish for aesthetical reasons it does also have practical advantages too. For one, I find the white on black button labels much easier to read than the old black on silver. Also, the old silver finish was reasonably tough but when scratched you could see the underlying plastic material. Scratch the surface of black plastic and you just see more black plastic. Also, black is much more stealthy than shiny silver. Purely on aesthetics I prefer the new mode dial too but from a controls and layout point of view, not much has changed. A user of the old Rebel picking up the new one is going to have no problems finding their way around. This familiarity has meant that I have hardly cracked open the user manual which is a pity because it means that I thinking I missing out on a some new features. I read about the new my-scene modes before asking Santa for this camera and they sounded useful , however, I've yet to use them, sticking to the familiar P, TV, AV and M modes instead. I should investigate my-scene because the built it scene modes (portrait, landscape, macro, action, night and suppress flash) frustrate me as they seem to put the camera back into jpeg mode rather than RAW and they take over the ISO setting. Am I missing something? One thing I was surprised by was how little difference 10 megapixels makes over 6. It might add a little more flexibility when it comes to cropping but in the situations I've encountered so far there is very little difference in images when viewed on a large screen or printed even on big paper. Whereas the improvements due to resolution are surprisingly small, improvements in low light performance and at higher ISO settings are noticeable. Despite cramming more individual sensors in the same physical amount of space on the film plane, digital noise is better controlled by the 400D. One thing that is a little frustrating about the new camera is it's tendency to under expose a bit. I currently have the exposure compensation set to +1/3 of a stop and I could probably get away with a little more and still get a better exposure than the camera indicates. Apparently, I'm not the only one who has noticed this which is at least comforting in that it is not something specific to my camera. Rumor has it that there is a firmware update coming that will correct this issue. All-in-all I like the new 400D. If I hadn't already bought into the Canon system the choice might have been a little tougher, but as it was I could get the new Rebel or the 30D if I wanted something a bit more pro-looking. The Canon line is in an unusual place right now with their 3 DSLR lines. The #D (single digit) cameras are professional grade equipment. Their ##D is their enthusiast line but the not so old 30D is matched or out spec'd by their 400D in the ###D (triple digit) 'beginner' line. 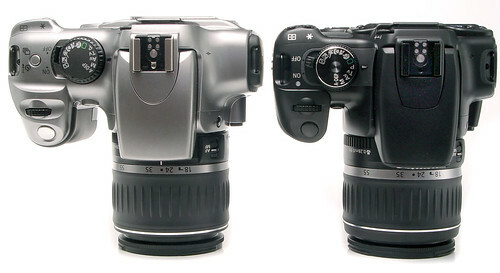 I doubt any 30D owners will be 'upgrading' to the 400D but I wouldn't be too happy myself if I had just bought the 30D. This has happened before in the Canon line where new features and technologies get applied to the bottom of the line cameras before their more up-market line. I don't pretend to understand why but I'm sure there will be a 40D launched in 2007. My prediction is that it will look and be built like the 30D but will have 10 megapixel sensor and the image reduction technology both from the 400D. Of course, this is nothing but an educated guess and Canon could easily prove me wrong. If you have the old 300D and have a few lenses, like I have, then the 400D is almost a no-brainer. It is worth the upgrade for the speed and buffer alone - more megapixels, dust reduction, the larger screen, more focusing points are just gravy. If you are not already invested in the Canon line then your choice is a little harder, however, like no one ever get fired for buying IBM, few photographers ever regret buying Canon.